For more info or order, please feel free to contact us. Our Series FTY vacuum turbine lube oil Filtration & Dehydration Machine is specially designed for purifying various unqualified turbine oil (such as ISO – VG – 46, 32, 68, etc.) from steam turbine system, gas turbine system & Fans, especially for serious emulsion turbine oil, it can quickly and efficiently break emulsification, separate water, gas, particles from oil. So that makes sure quality of treated oil to achieve new oil's standard, ensure whole turbine system work safely. 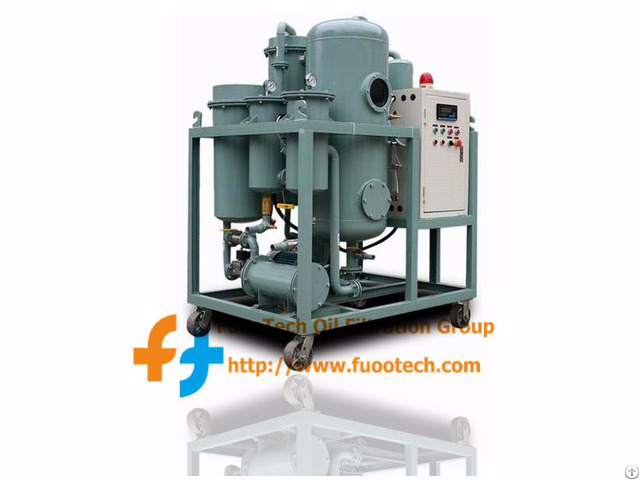 This equipment use a special polymer materials as filter medium combined with vacuum separating technology to break emulsification, dewater, degas, remove acid and particles, make the badly turbid turbine oil becomes clean. Series FTY is a perfect turbine oil purifier for live line work; also it can purify low viscosity hydraulic oil and lube oil. Duplex 3D Stereo-evaporation technology, equips with unique and advanced dewatering, degassing components, can rapidly and effectively separate water, gas from oil. With distinctive removing impurities technique filtering through double FH trapezoidal network and absorbing by high polymer material, this machine can make the ß3 equal or surpass 200 and make the cleanness lower grade 6(NAS1638). 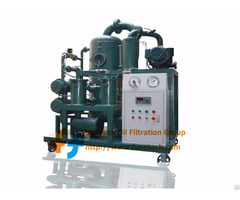 Multi-stage precision filtration process remove large quantity of particles & impurities from the oil. Can work online with stream turbine and hydraulic turbine. 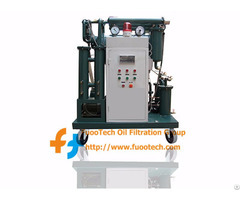 Business Description: Fuootech Oil Filtration Group (Main branch in China: Chongqing FuooTech Oil Purifier Technologies Co., Ltd) is one of largest R&D based high-tech group engaged in designing, developing, manufacturing and exporting various vacuum oil/fluid purifiers, oil filtration system, oil regeneration machine and oil testing kits for various industries, helping clients all over the world solve various oil problems. Fuootech develops custom solutions for virtually any application involving industrial oil management. With Fuootech oil management systems, oils can be re-used indefinitely, thus drastically reducing new oil purchasing and waste oil disposal, protecting environment, and improving productivity for industries to be more competitive in the global economy. Nowadays, the company's sales and service network covers all the provinces of China and exports to more than 118 countries. Our products are more and more popular in domestic market and international market based on High quality, advanced technology, competitive price and excellent before & after sales service, as well as continuous technical supports. 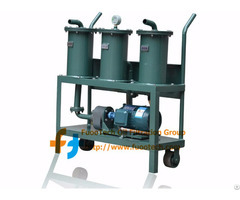 Fuootech’s oil filtration systems & oil testing kits are extensively used in the fields of electrical power, power station, power transmission, power generation, Petrochemical, petroleum, Paper and Pulp, compressor, mechanical manufacture, steel mills, electrical utilities, engineering contractors, metallurgy, railway, aviation etc. which are consuming various oils. More than 100 standard models are offered to different clients and also can be customerised according to actual need of oil solutions in different areas.